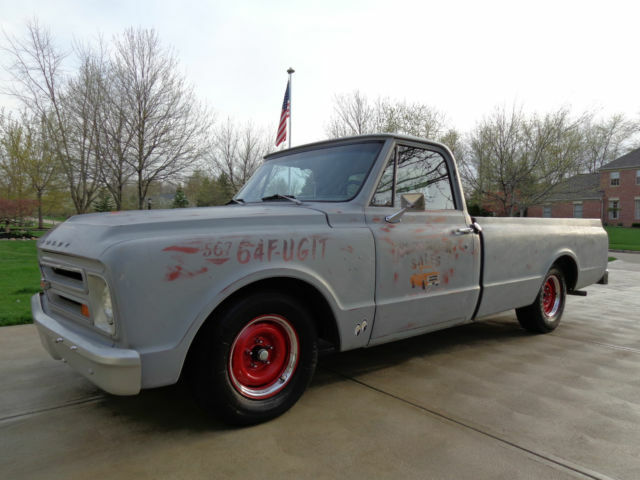 THE FIRST BID CAN OWN THIS PICK-UP. THE OPENING BID IS THE RESERVE! EXTREMELY CLEAN AND SOLID FROM TOP TO BOTTOM! A TRULY GORGEOUS TRUCK WITH PERFECT PATINA PAINT AND CUSTOM PIN STRIPPING RECENTLY ADDED! 71K ORIGINAL MILES ON THIS EXTREMELY CLEAN AND SOLID BODY! THIS TRUCK CAME FROM CALIFORNIA AND HAS AN AMAZINGLY CLEAN BODY, FRAME, AND UNDERCARRIAGE. WE OPTED NOT TO PAINT OR DETAIL THE UNDERCARRIAGE AS TO SHOW THE NEW OWNER HOW CLEAN THE METAL IS UNDENEATH. POWERED BY A VERY STRONG RUNNING CHEVY 350 BEARING CASTING NUMBERS 14016379 . EDELBROCK CARB. THE MOTOR STARTS EASILY, SOUNDS SMOOTH AND RUNS BEAUTIFULLY. THIS IS A TURN THE KEY AND GO TRUCK! TURBO 350 TRANSMISSION WITH A 32" LOKAR SHIFTER. NEWER SPRINGS, CPP LOWERING KIT, NEWER SHOCKS, NEW TAIL LIGHT AND BACK UP LENSES, NEW SEAT UPHOLSTERY, NEW DOOR UPHOLSTERY, NEW VISORS, NEW DOOR WEATHER STRIPPING, AND NEW GAS TANK SENDING UNIT. EXTREMELY CLEAN METAL THROUGHOUT! A PERFECT PATINA PAINT JOB WITH AN EXTREMELY CLEAN BODY. ORIGINAL WOOD FLOOR IN THE BED ALONG WITH AN AMMO BOX AND TOOL BOX BOLTED DOWN FOR STORAGE!!! IT IS A GET IN AND GO TRUCK THAT NEEDS NOTHING. IT DRIVES LIKE NEW! YOU CAN FEEL CONFIDENT DRIVING THIS TRUCK CROSS COUNTRY! CALL ANYTIME WITH ANY QUESTIONS! THIS TRUCK IS FOR SALE LOCALLY AND WE RESERVE THE RIGHT TO REMOVE IT FROM EBAY. BEAUTIFUL GAPS, SEALS, AND SEAMS. NEW DOOR WEATHERSTRIPPING. GORGEOUS INTERIOR WITH BRAND NEW SEAT UPHOLSTERY AND MATCHING DOOR PANELS AS WELL AS VISORS IN THE SAME MATERIAL. EVERYTHING IS IN OUTSTANDING CONDITION INCLUDING THE SEATS, DASH, DOOR PANELS,...ETC.. ALL OPERATING LIGHTS, DASH LIGHTS, HEATER, BLINKERS, HORN, ETC.. ARE IN WORKING ORDER. AFTERMARKET SUNPRO 3 GAUGE CLUSTER. PIONEER CD PLAYER WITH SONY SPEAKERS. BEAUTIFUL 5 LUG WHEELS WITH NEWER BEAUTY RINGS. ALL THE GLASS IS IN GREAT CONDITION WITH NO CHIPS OR CRACKS. THE WINDSHIELD AND REAR GLASS ARE NEW! BlueLine Classics is located in North Royalton, Ohio. We are a licensed Ohio car dealer that specializes in muscle, classic and antique cars & trucks. We don't sell anything that we aren't proud to drive ourselves. We own our entire inventory. Our cars our hand picked by us and a great deal of consideration goes into every purchase we make and every vehicle we offer for sale. We purchase every vehicle while keeping in mind these cars will be an investment to the next owner. We DO NOT do any consignment sales, we own every car we offer for sale. All of our inventory is stored indoors in a climate controlled facility. We price our cars to sell fast and give our customers the best deal we can. We pride ourselves on repeat customers and new friendships. We encourage you to compare our prices on comparable cars to other dealers as well as private owners. Please research our business to find out what we are all about... Faith, family, fun and classic automobiles!!! Check out our unsolicited feedback from satisfied buyers. The feedback speaks for itself! Please remember our cars are classics and most of our inventory is over 40 years old. They're built to drive and do develop drips from long periods of sitting due to expanding and contracting seals and gaskets. It's seldom that we come across a classic that's completely drip free. We do our best to describe our inventory in full detail, to include pictures and video; however, due to the age of these cars, we're unable to offer a warranty. While we only deal in vehicles that are in quality condition, we always prefer the buyer take the time to check the vehicle out in person or arrange for a third party vehicle inspection. We strive to make our customers happy and pride ourselves on positive feedback.